In this collection of Hardwood we offer our Solid Walnut Herringbone flooring. These products range from 2 1/4" wide to 10" wide. Walnut is a gorgeous deep chocolate brown coloring. Each of these products are milled in the USA to have Double End Groove milling on the ends and Tongue & Groove milling on the sides. 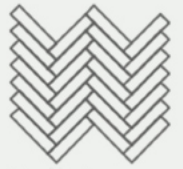 These features are what allow Herringbone to be installed correctly.